In Print Professional Writers’ Organization and Emmanuel Lutheran Church, Art@Emmanuel, and the Center for the Arts and Spirituality, are proud to bring Word of Art 2 to Fall ArtScene 2015. Word of Art 2 is a collaboration of Authors and Artists. The show is comprised of 35 artists’ canvases that were inspired by the written word. All of the poems, essays, and short stories and their accompanying works of art will be available for viewing in Emmanuel’s Celebration Room Gallery. Many of the canvases are available for sale. Also available to purchase is a full color, hard cover, beautiful publication that includes the Words and Art. Please join us on Friday, October 2nd from 5 to 9 pm & Saturday, October 3rd from 4 to 9 pm for ArtScene. Word of Art 2 Authors and Artists are invited to attend the receptions and read their pieces and describe their art. This is a wonderful opportunity to introduce your published work to a whole new audience. Please contact Ruth Ann Molyneaux @ 815-218-5149 if you would like to schedule a reading. Hors d’oeuvres & sweets will be served. Emmanuel Lutheran Church, 920 3rd Ave., at the corner of 6th St & 3rd Ave in MidTown. Use the North entrance off of the 2nd Ave parking lot. 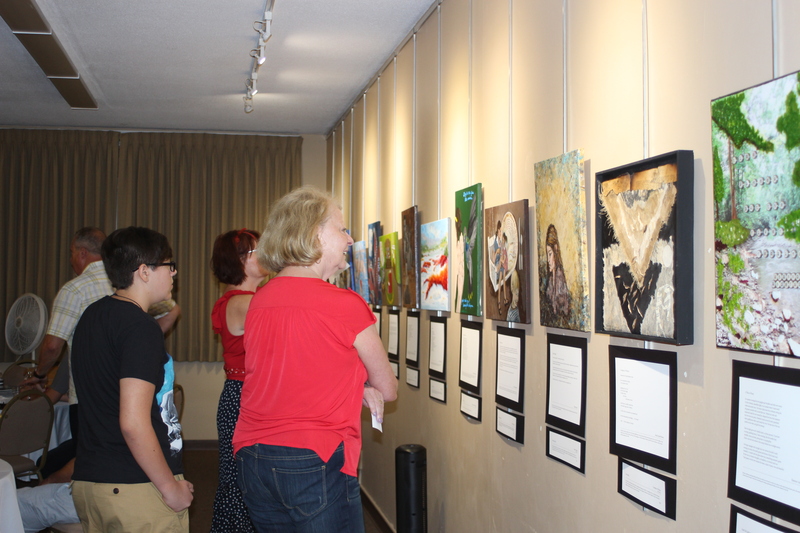 Lovers of both Word and Art enjoy the Word of Art 2 gallery exhibition at Emmanuel Lutheran Church. Next Post 4th Annual Writers Block Party!